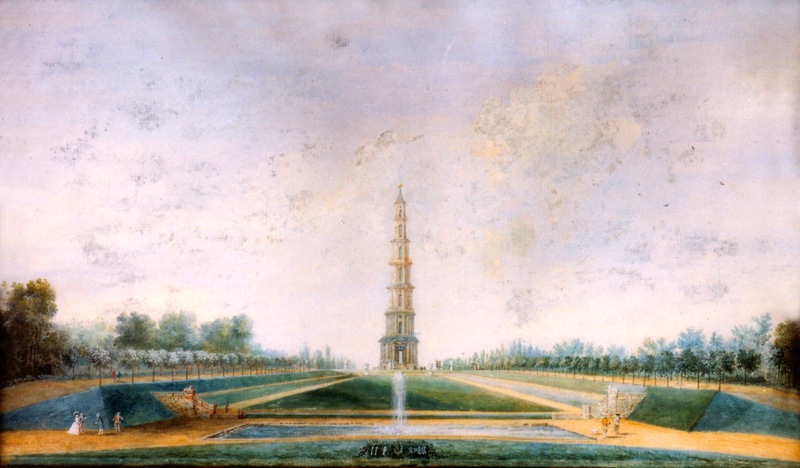 The ‘Duke of Choiseul’s Folly’ or ‘Friendship monument’ was built in 1775 after his exile from King Louis XV’s court as a token of his gratitude towards his loyal friends who stood by him. Famous for its beauty and element of surprise, the Pagode is a monument which measures 44m high and is held up by a ring of 16 columns and 16 pillars. Each of its seven storeys is constructed as a dome. Each dome is accessed by a steep, narrow staircase which goes right to the top. This staircase is made from mahogany except for the first floor where it is made of stone. It has a cast iron banister which is decorated with interlocking double C gilded bronze initials of Choiseul and his wife Crozat. From the top, enjoy a glorious panoramic view of the forest of Amboise and the Loire Valley. Its utility was to follow the hunting’s parties from the Pagode. 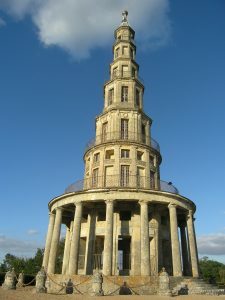 Very slender, due to the architect Louis-Denis Le Camus, the Pagoda of Chanteloup is inspired by the Chinese pagoda Kew Gardens, designed by the great William Chambers. The Camus also draws a small Anglo-Chinese garden, located under the pagoda in the north-east square, with kiosk, river, small pond and cooler. In addition, the Scottish gardener Mac Master, of the entourage of Thomas Blaikie, also intervenes on the field. Famous for its beauty and the surprise it provokes on the site, this monument 44 meters high, is supported by a peristyle of 16 columns and 16 pillars. Each of the 7 floors is built in dome. Each cupola is cut by a cramped and sloping staircase that climbs to the top. This staircase is made of mahogany wood, with the exception of the first floor which is stone and guarded by a wrought iron banister, adorned with interlocking double C gold bronzes, with the initials of Choiseul and Crozat, his wife . 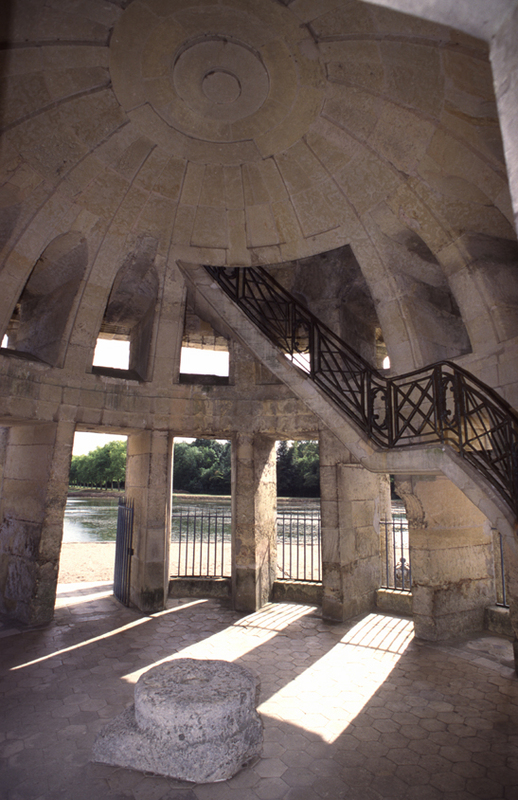 It offers from its summit a magnificent panorama of the forest of Amboise and the Loire Valley, and served at the time as a hunting lookout. The château was constructed in 1713 by Jean d’Aubigny for the Princess of Ursins. The estate was bought by the Duke of Choiseul in 1761. The Duke hired the famous architect Le Camus to improve and enlarge the building. His exile ended with the succession of Louis XVI, Choiseul died in 1785 and his estate was sold to the Duke of Penthièvre. In 1802, the château was acquired by Chaptal, noteworthy minister to Napoléon 1st, great scientist and creator of chemical processes. It was at Chanteloup that he developed sugar beet farming, sugar extraction and sugar refining thus providing our country with an important new resource. In 1823 Chaptal had to let Chanteloup go. Whereas the Duke or Orleans (future king Louis-Philippe) bought the Pagode in order to link it to the forest he had just acquired, the castle fell into the hands of the merchants notoriously known as ‘La Bande Noire’ ‘the black pack’). The goods were sold, the château destroyed and the gardens divided. • The two charming pavilions in Louis XVI style located on the Amboise side which used to indicate the estate entrance by ‘la Grille Dorée’ (the golden gate). The gardens of Chanteloup were very extensive – they covered no less than 8000 acres and were developed throughout the whole of the XVIII century. 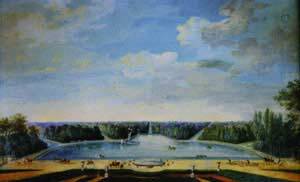 Jean d’Aubigny started planting the gardens in 1710. The concept was formal and very traditional : a vegetable garden, a French garden around the château and a wooded garden evenly set out with copses and groves. • The ‘Great Park’, deep in the forest with crossroads, star designs and long straight. • He then redesigned the ‘Little Park’ gardens which spread out over 200 acres, as is shown on Jean d’Aubigny’s design which we still. In order to supply the numerous ‘water games’, Choiseul embarked upon more major works which involved bringing up water in abundance to his parks. A little later on, he had a semi-circular water feature dug out at the highest point of the Chanteloup grounds. For a sufficient water supply, he had no qualms about joining up the ‘Etangs de Jumeaux’, two lakes located in the forest over 12kms away. With a difference in water level of only 6m, he installed a pipe and siphon which pumped the water from the lakes right over a small valley! Towards 1770, Choiseul undertook the task of extending this water feature by adding a Grand Canal which measured 600m long and 100m wide. North of the wooded garden he installed a charming little rectangular garden called the ‘Jardin des orangers’ (orange garden). Sometime later on, Choiseul transformed the wooded garden into a picturesque ‘anglo-chinese’ style garden. A river wound through it and its waters poured out of a 4m high water nymph thus supplying the central water ring in the orange garden. Choiseul gave in to the Chinese trend which was fashionable at the time and rejected the aristocratic symmetry of the French garden. He then ordered Le Camus to restructure the gardens at Chanteloup. Inspired by anglo-chinese style gardens, Le Camus tore down the wooded garden; the rectangular ponds were destroyed and replaced with a magical, winding river which meandered over rocks and under bridges with waterfalls pouring into a nymph. The straight lined paths were replaced with sinuous tracks which wound through pergolas, ice stalls and shady garden stands. Captivated by the beauty of the prevailing century, Choiseul wavered however between the natural feel of the anglo-chinese style garden and the rigueur of the French garden. Thus he concluded his garden fantasy by constructing an unnecessary, exotic extravagance (The Pagode) right in the middle of a typically classical perspective which Le Camus then built in the purest style of Louis XVI. The gardens were destroyed during the revolution. • The semi-circular main water feature which leads off the Plane tree lined Grand Canal. The canal had become swampland and has now been turned into a lawn. • The forest paths in the 28 acre park and the view of the crossroads which branch out into seven paths.